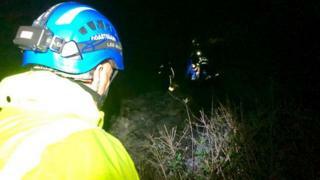 Five people have been rescued after they got stranded on a cliff edge on Dorset's Jurassic Coast. A coastguard team found the group - two men, two women and a girl - near the prison and young offender institution in Grove Road shortly before 23:00 BST on Wednesday. Crews used a rope system to reach them and spent nearly three hours lowering them down individually. A HMP/YOI Portland spokesman said none of the five had escaped the prison. The group, aged between 14 and 20, were treated at the scene by paramedics and none suffered serious injuries. No action was taken by police.